It’ll see your Citi Bike expansion — and raise you 100 miles of protected bike lanes! 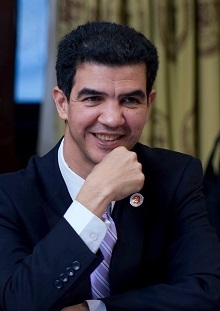 Council Member Ydanis Rodriguez (left) threw a bombshell into the otherwise simple announcement Thursday of Citi Bike’s massive expansion to demand a similarly huge expansion in the installation of protected cycling routes. 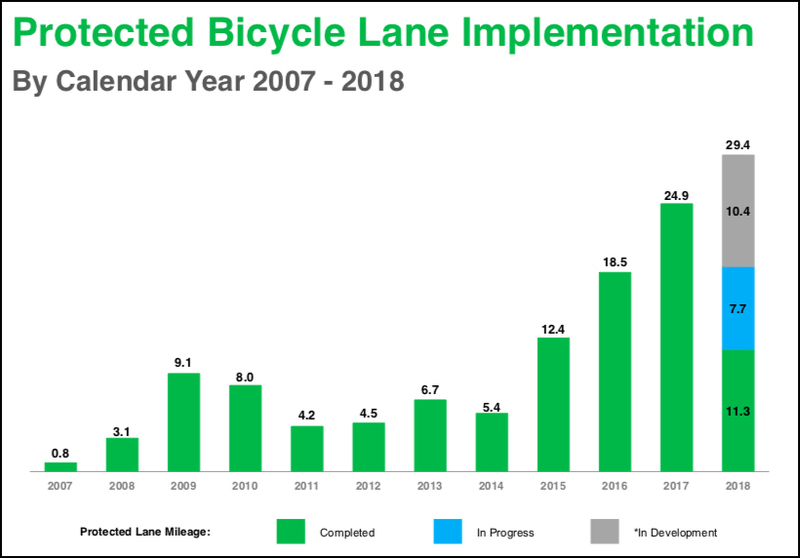 The construction of protected bike lanes has been a priority for Mayor de Blasio, rising from just 5.4 miles installed in 2014 to an estimated 29.4 by the end of this year. Last year, the city laid down 25 miles of such lanes. But Rodriguez wants much, much more — in light of both the Citi Bike news on Thursday and his own effort to legalize electric scooters and throttle-controlled e-bikes. But Trottenberg suggested she would love to do more. “I take the chairman’s challenge,” she told Streetsblog. To Rodriguez, bike lanes are about more than just safety or providing routes for a basic form of mass transportation. He said his goal is to reduce car ownership from 1.4 million vehicles today to 1 million by 2030. “The only way to get there is to improve mass transportation and connect the 8.6 million residents and the 65 million tourists to other modes of transportation,” he said. Is this the same Ydanis Rodriguez who was against the bike lane on Dyckman Street? I think we can do even better than reducing car ownership to 1 million. A big missing piece of the pie is bike parking. You can have the greatest bike infrastructure in the world but a bike is still functionally useless as an errand appliance if you don’t have a safe place to put it at your destination. Businesses should be strongly encouraged to have safe bike parking, preferably indoors near a security guard. Schools and work places should have indoor bike parking by default. Compared to the cost of car parking, this is fractions of a penny on the dollar. I just wonder if people found they could do most or all of their errands by bike, instead of by car, whether they would still consider car ownership a worthwhile proposition. There’s also the coming autonomous vehicles which if done right can dramatically reduce car ownership. I think the number we should be shooting for by 2030 is half a million vehicles. That can realistically happen if we work towards it. Great comments by Rodriguez, who recently betrayed bicyclists. Side note: 100 is not “four times more than” 25; it is four times as many. See this thread at The Straight Dope. Also, a great book that goes into depth on this question is Innumeracy by John Allen Paulos. 1. Calling the thumbtacks in the sunnyside lane a ‘terror attack’ is really terrible choice of words under any circumstance… especially considering there was an actual terror attack on the Hudson River greenway just a year ago. 2. Not pointing out the absurdity of Ydanis’ 100 miles per year claim is a missed opportunity. Not pointing out his own hypocrisy with regards to his opposition to the Dyckman protected plan in his own backyard is poor journalism. 3. Not pointing out how inaccurate the city’s numbers on the bar graph is also lazy. They’re counting lanes like Greenpoint Ave bridge as protected even though the flexibollards providing separation are destroyed and DOTs official stance is to not replace them. So protection for many of these miles is by paint only. The city should be taken to task for this. I enjoy Streetsblog but expect more thorough reporting. Where in _Innumeracy_ is the discussion about “times more”? I have the book but couldn’t find the relevant passage after a quick scan. Maybe I should read the whole thing again; it’s been many years! It has been a long time since I read Innumeracy, as well. I hope I haven’t misattributed this! I am pretty sure that a discussion of this question is in there. I want to entertain the possibility that I am confusing that book with Twice as Less by Eleanor Wilson Orr. But this latter book is mainly about the norms of Black English, and about the failure on the part of schools to meet the educational needs of that dialect’s speakers. It is not about a fundamental misunderstanding of mathematical concepts. So my guess is still that Innumeracy contains a treatment of the erroneous use of “X times more than”. Agreed. I expect this type of hyperbole and strategic omissions from the NY Post, and their reputation is garbage as a result. Quality reporting from Streetsblog has proven very successful over the years, and I expect that quality to continue. I do agree that this article should have mentioned Ydanis support of removing the protected lane from Dyckman street in his own district. That is a badly needed bike lane that was working and the removal process circumvented all the community approval processes required for such a change. I do like, though, that Ydanis is thinking big. 100 miles a year of (truly) protected bike lanes is entirely possible if there is the political will. I would like the goal to be to reduce car ownership citywide from 1.4M to .5M next year. Rolling out meters on all streets would lead to this massive reduction. And ending all parking placards and ending the expectation that municipal workers can park illegally for free with impunity at their workplace. Streetsblog is a platform run by advocates and guided by one principle: demonstrate efficacy. It’s astonishing how broad their blind spots turn out to be sometimes. Very poor reasoning on that first point. The occurrence of a terror attack on the Hudson River Greenway in no way negates the fact that there was a terror attack on this street, as well. Also, while Rodriguez’s past mistakes should be mentioned, this is no reason not to welcome his return to promoting sensible policies. I agree with the third point; flex-posts do not create protection for a bike lane. No, don’t bother with your dictionary definition defending the usage. This isn’t about that. This is about the way you’re portraying yourself, as a cyclist, to drivers, pedestrians, and non-cyclists online. You cannot reasonably deny that most people would reject the label of “terrorism” for this crime, nor can you reasonably deny that most people, like Dave here, would view the usage of the label as histrionics by cyclists. Accordingly, by your own oft-repeated ad nauseam rationale, you should not describe this as terrorism, despite however you’d pedantically justify doing so (as I’m sure you’re eager and ready to do – again, save it). Must be a different Ydanis Rodriguez who said this, given that the one I have as a councilmember pushed relentlessly to rip out the ONLY protected bike lane in all of Inwood. 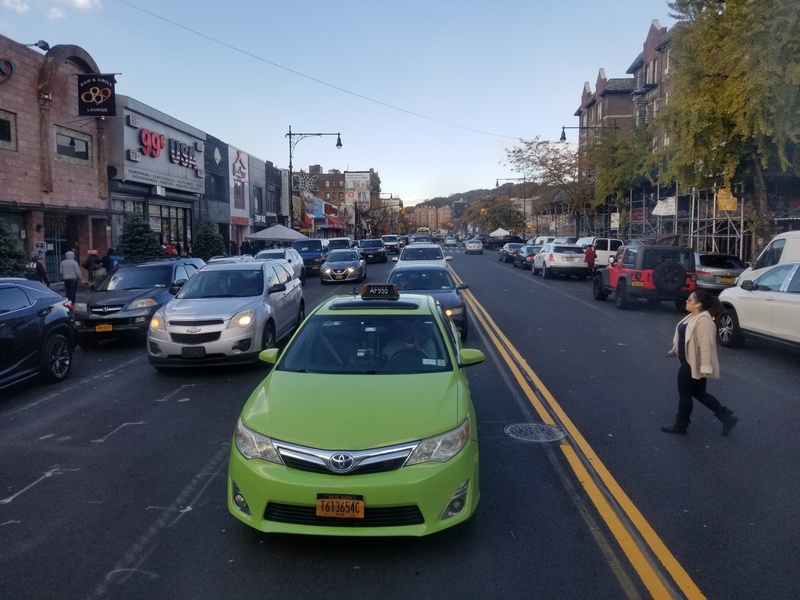 Dyckman Street now has no bike lanes at all, months after it was repaved, due to the political morass he directly caused. Why? Because when small business donors/cronies complained about losing their double-parking culture, Ydanis folded like a cheap suit. Why bother with good urban planning after all when there are unsubstantiated and questionable needs for tiny stores to sell (what exactly?) to double-parked cars instead of the 40,000 actual residents who live within walking distance. If the intent was to frighten people into or out of some action, or generally frighten the population, then it’s terrorism. But if I could propose a term everyone should be able to agree with when these cases come up: sociopathic. I don’t see anything wrong with shooting for near-zero personal car ownership. However, the vast vast vast vast majority of the world gets along fine with sensibly-placed bike parking (it can be outdoors, at most under a pavilion). Imposing bike parking costs on businesses and landlords is bad policy, and will be perceived (accurately or not) as imposing those costs on non-cyclists. I have nothing against outdoor bike parking if it’s at least semi-protected from the elements and secure from theft. Theft is really the larger issue here, hence my suggestion of putting the parking near security guards. It may not be as much of a problem in Europe, or much of the US, but in NYC park a nice bike outside and chances are great it will at least be missing parts the next day, if not be gone entirely.